Director of post-graduate school on Animal health,farming and production and post-graduate school of Medicine and surgery of horse - University of Teramo. Internal Tutor of ESR9: Evaluation of the intestinal microbiome in obese pet owners and their obese pets. Now He teaches Infectious Diseases of Animals, Infectious Diseases of Pets and Infectious Diseases of Livestocks at the Faculty of Veterinary Medicine of Teramo and he is full professor in Infectious diseases of animals and director of post-graduate school on Animal health, farming and production and the post-graduate school of Medicine and surgery of horse, both at the Faculty of Veterinary Medicine of Teramo. From april 2013 Coordinator of the three-years degree on Animal welfare and protection. November 2009-March 2013 Vice-Rector of the University of Teramo. November 1996 he attended the Institut für Virologie der Tierärztlichen Hochschule of Hannover (Germany), where he worked on the biomolecular typing of canine distemper virus strains. From 1990 to 1994 he was with the Institute of Infectious Diseases of Animals of the Faculty of Veterinary Medicine of the University of Bari. 1989 Ph.D. in Veterinary Parasitology from University of Bari. 1985 Graduated in Veterinary Medicine from the University of Bari. His research areas are the etiology, the pathogenesis, the diagnosis and prophylaxis of the infectious diseases of the carnivores and ruminants. 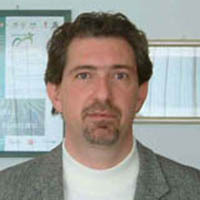 He is author and/or co-author more than 130 scientific papers on italian and international journals. Click here to see them.